By Kate Moran Any pundit worth his salt is familiar with the 1916 Sykes-Picot agreement, a secret treaty signed between the British and French governments in the aftermath of World War I and the dissolution of the Ottoman Empire, in an effort to demarcate their respective spheres of neo-colonial influence in the Middle East. [i] It was this agreement that led to the establishment of the British Mandate in Palestine, and in the views of many, a critical component of Israel’s ultimate declaration of state in 1948. [ii] Historians, politicians, and laymen alike all invoke the language of Sykes-Picot to either voice their support or opposition to the legality of Britain’s decision to allow for a Jewish homeland in historical Palestine. Yet few consider the implications of this agreement for the rest of the region. Indeed, Sykes-Picot remains relevant today and, in light of the ongoing Syrian Civil War, can provide a historical context for understanding how broader political and economic trends in the post-War period have shaped current social realities. At the 1919 Paris Peace Conference, Britain and France rejected Arab leaders’ bid for Syrian independence. [iii] Not soon after, the Sykes-Picot Agreement officially partitioned the Middle East into roughly what we know it as today. Territories ceded to French control included Syria, which would remain under European mandate until 1944. Though the vestiges of colonialism are by no means the only forces at play in the Syrian Civil War, the legacy of meddlesome European—and later, American—intervention and political power plays cannot be ignored. Sectarian violence is a feature of the conflict often talked about, but rarely with acknowledgement of the ways in which Syria’s colonial past influences this dynamic. Part of the reason the Middle East seems so endlessly mired in conflict is because its history is likewise enmeshed in it. The geographical boundaries of the region are almost entirely arbitrary; the interested parties of the Sykes-Picot agreement carved up the Middle East with little to no regard for indigenous social structures like ethnic and tribal affiliations. How can a country and its people—much less an entire region—be expected to identify with and adhere to boundaries that they themselves did not determine? Perhaps if the Arab world had been given even minimal say in what their newly-formed, independent republics and states would look like, we would see far less sectarian division today. The rise of the Islamic State in Iraq and Syria has once again pushed Syria’s colonial past to the fore. More than ever, sectarian violence is increasingly coming to characterize a country with one of the Middle East region’s richest and most extensive histories of religious and cultural diversity. Islamic State’s Sunni fighters, in capturing cities, occupying territories, and cleansing these areas of “unorthodox” (read: non-Islamic State sanctioned) elements, seem to be attempting to rewrite the history (and map) of the modern Arab world. Their defiant and brutal acts of violence are undertaken with complete disregard for the arbitrary boundaries first established in the 20th century. Yet Islamic State is equally colonialist in its division of and dominion over the Middle East. It too is an imported government structure and is just as unsustainable as the French and British mandates were in the post-war years of the 20th century. It too displays blatant disregard for historically and culturally significant social constructs. And it too is seeking to “whitewash” the Arab world, only under the guise of religion rather than capitalism or imperial ambition. Because the Islamic State seeks to homogenize the Arab world, it is effectively attempting to strip the region of its heritage. In doing so, it will alienate not only large minority populations who feel threatened by such whitewashing, but also those in the region who value the Arab world’s heterogeneity. Make no mistake: the Islamic State’s legacy is one that will leave its mark—just not the one that it intends. Its brutal campaign to “retake” the Arab world in the name of a perverted interpretation of Islam will fail. Artificiality in the name is Islam is no better than artificiality in the name of colonialism; it for this reason that the Islamic State can never truly be embraced or sustained on a wide scale. In 20 years, or 30, or perhaps 50, the Middle East of today will no longer exist. The borders first drawn in 1916 will be reconfigured, if not entirely transformed. The region’s colonial legacies—those of Europe, the United States, and even the Arab world itself—will be superseded by a greater legacy—that which is shaped by and for the people of the region. And when all is said and done, the best form of governance for the Arab world—one cultivated in consideration for, not in exception of, social divisions—will emerge. [iv] Already among Arab youths, we see increased recognition, rather than merely tolerance for, ethnic and cultural (and even sexual) diversity. Inclusive governance will be the most lasting legacy of the Middle East. Although at first glance maintaining these ethnic and religious divisions may appear counterproductive to achieving regional stability, there are, in fact, they are the only way that such stability can be achieved. This is not to say that a social or political hierarchy should be established, so that one ethnicity or religious group is privileged over another. Rather, fully embracing each group while also preserving their distinctness is the best way forward. Rather than conceptualizing ethnic and cultural diversity in the Middle East as a prerequisite for government dysfunction, it would behoove the West—and those who care at all about the Middle East beyond its geopolitical strategic value—to understand this diversity as an impetus for inspiring effective governance. Most importantly, these divisions will inspire social unity when extricated from a colonial framework of suppression and homogenization. The Syrian conflict is a complicated muddle of individual, national, and international interests. The Islamic State will not be defeated overnight, and solely blaming the European occupation and colonization of the Arab world for its current woes is both shortsighted and unproductive. Rather, understanding this history might help those in positions of influence to make better-informed decisions about how and when to intervene in the region, and how current sociopolitical realities are shape. In this way, we might begin to understand how we might best help—even if it means staying out of it. [i] “Sykes-Picot Agreement of 1916.” Encyclopedia Britannica Online. January 20, 2015. 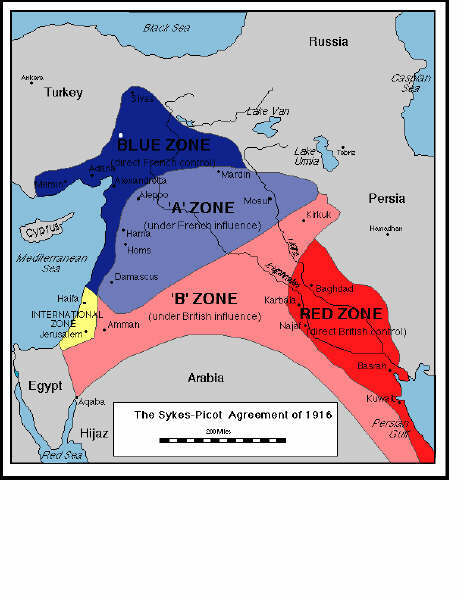 Accessed April 2, 2015. http://www.britannica.com/EBchecked/topic/577523/Sykes-Picot-Agreement. [ii] Kampfner, John. “NS Interview - Jack Straw.” New Statesman. November 18, 2002. Accessed April 2, 2015. http://www.newstatesman.com/node/144241. [iii] “The Paris Peace Conference and the Treaty of Versailles.” U.S. Department of State: Office of the Historian. Accessed April 2, 2015. https://history.state.gov/milestones/1914-1920/paris-peace. [iv]Yazan Doughan, “Dilemmas of Identity and Cultural Diversity Among Ammani Youth,” The Issam Fares Institute for Public Policy and International Affairs, AUB United Nations Children’s Fund (UNICEF), 2011, 9.